Do-It-Yourself Wall Signage Kit Makes Personalizing And Branding Your Office A Breeze. Blank Insert Sheets Allow You To Print Customized, Professional-Looking Signage With Any Laser Printer. Clear, Nonadhesive Inserts Create An Elegant Appearance That Resembles A Permanently Engraved Sign. Easy-To-Use Design Lets You Quickly Reuse Signs By Simply Switching The Printable Insert. Shatterproof Lenscovers Are Engineered With Specific Tolerances Combined With The Isometric Design That Creates A 3d Look To Gracefully Protect Your Graphic And Text. Wall Signage Kit Includes Nameprint Graphics Design Software, Polished Silver Steel Plates, Polished Silver Wall Holders With Hook-And-Loop Fasteners And Double-Sided Adhesive, Clear Lenscovers And Printable Insert Sheets.. Do-It-Yourself Wall Signage Kit Makes Personalizing And Branding Your Office A Breeze. Blank Insert Sheets Allow You To Print Customized, Professional-Looking Signage With Any Laser Printer. 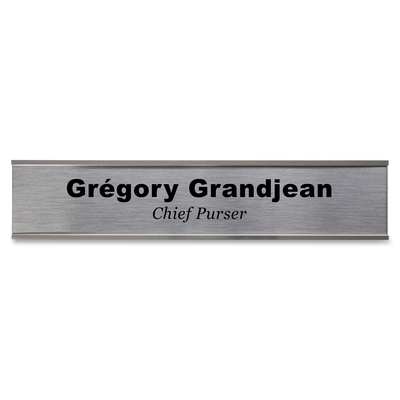 Clear, Nonadhesive Inserts Create An Elegant Appearance That Resembles A Permanently Engraved Sign. Easy-To-Use Design Lets You Quickly Reuse Signs By Simply Switching The Printable Insert. Shatterproof Lenscovers Are Engineered With Specific Tolerances Combined With The Isometric Design That Creates A 3d Look To Gracefully Protect Your Graphic And Text. Wall Signage Kit Includes Nameprint Graphics Design Software, Polished Silver Steel Plates, Polished Silver Wall Holders With Hook-And-Loop Fasteners And Double-Sided Adhesive, Clear Lenscovers And Printable Insert Sheets.